Preheat the oven to 220C, gas mark 7. Toss the vegetables with the coriander seeds and 1½ tbsp olive oil. Season and roast for 30 minutes, stirring halfway through. Marinate the chicken in the honey and balsamic vinegar for 5 minutes. Heat the remaining oil in a large pan and cook the chicken breasts for 7–8 minutes on each side. Check they are cooked through before removing from the pan. Add the orange juice and zest to the pan. Allow to bubble until the liquid is reduced by half. 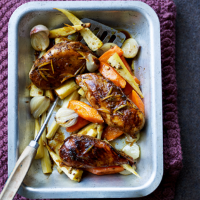 Serve the chicken with the roasted vegetables and the orange sauce spooned over.